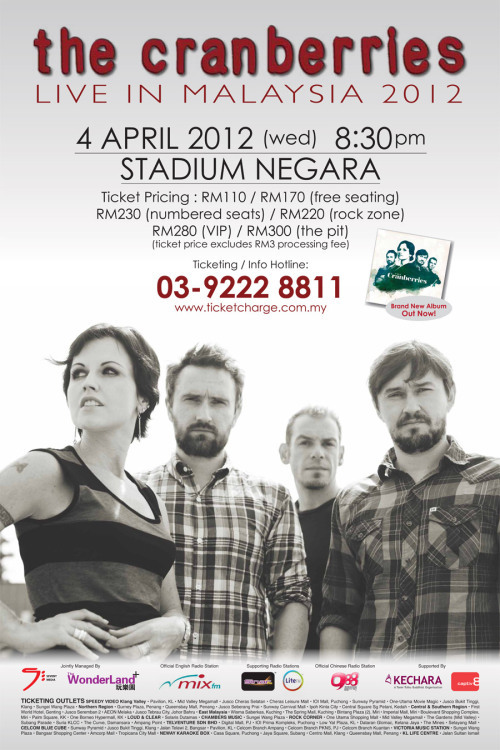 The Cranberries Live in Malaysia 2012 is absolutely the comeback concert of one of the world’s biggest bands. Definitely not to be missed. For further info, contact TicketCharge hotline at +603 9222 8811. The Cranberries are back! The original Irish four-piece fronted by Dolores O’Riordan, who lit up the charts for over a decade with such impressive CV is back with a world tour! The band will kick off their long awaited Malaysia tour on 4 April, Stadium Negara, 8:30p.m. Ticket prices are categorized into RM110 and RM170 for free seating, RM230 and RM280 for numbered seating; and RM220 and RM300 for Rock Zone and The Pit respectively. The Cranberries performed to millions of fans across the globe. And now after taking a few years out to raise their families, the band is thrilled to be back with Roses, their sixth studio album. The new phase in The Cranberries career comes on the back of a successful reunion tour in 2010 which had them crisscrossing the globe playing to sold-out audiences every night. It was during sound checks on the tour that Dolores, guitarist Noel Hogan, his brother Mike on bass and Fergal Lawler on drums found time to trade ideas and melody hints in the search for some brand new songs from that distinctive Cranberries sound. They will release their first new studio album in over 10 years. The result is Roses, 11 new songs from The Cranberries. Produced by the band’s old friend and collaborator Stephen Street (The Smiths, Blur and more recently Kaiser Chiefs) the songs on Roses sound like nuggets buried deep inside The Cranberries’ soul harking back to the freshness and acoustic originality of the band’s first two albums, Everybody Else Is Doing It, So Why Cant We? and No Need To Argue. The innocence is back in the melodies, which are given plenty of room to breathe while the words have matured to explore the twists and turns of life’s uncertain paths. And in every corner you’ll find the extraordinary sound of Dolores O’Riordan’s voice, the pivotal instrument which transformed this band from a group of young Irish hopefuls at the edge of the 80s into an MTV sensation and worldwide supergroup within just a few short years. The Cranberries will be touring Australia before they reach the shores of South East Asia; starting with Singapore on 2 April, then Kuala Lumpur on 4 April, moving on to Taipei on 6 April and Hong Kong on 8 April. Finally stops at Manila on 10 April before the head back to Europe to continue their world tour. Originally formed in 1989 as The Cranberry Saw Us, Noel, Mike and Fergal first met Dolores O’Riordan in May 1990 after she auditioned for them shortly after their original singer left the band. They knew instantly they had found an extraordinary voice and a songwriter whose lyrics could compliment Noel’s unique guitar sound. The hits were just around the corner and soon after signing to Island Records the single “Linger” was adopted by MTV in America who played the video every hour. The soft-sided tune went on to become a massive worldwide hit, followed by the sharper edged “Dreams”. A fairytale start to an unforgettable decade. In September 2003, as they considered recording another album, the band put the brakes on what had turned into an endless routine of performing and recording and went their separate ways. Glad of the break, the four who had all married by this time stepped out of the glare and returned home to raise their young families. The break proved quite successful in that respect. At a recent children’s party in Limerick, to which all four members were invited, they realized there are now more than a dozen little Cranberries! But during their time off from each other, some of the members continued to explore new sounds. Dolores released two solo albums, Are You Listening in 2007 and two years later No Baggage. Noel continued to write and produce releasing Mono Band in 2005 and later, Arkitekt. Fergal fed in to several acts in the local Limerick scene including The Low Network and Brendan Markham. And Mike stayed out of studios altogether, preferring to run a successful restaurant in Limerick city. In 2009, Mike joined his brother Noel to perform some Cranberries songs at a college event in Dublin to honour Dolores. Of the performance Dolores says “The minute we started playing it felt like we’d never stopped. There’s something about playing with the Cranberries, it’s like putting on the pair of perfect shoes. It’s a chemistry. It just fits.” By then, Noel was back in touch with his former lead singer, sending her a variety of musical ideas for new songs. The small acoustic event helped ease the partnership back together again and within the year the Cranberries were testing the waters with some low-key shows. The following year saw them back up to speed again with a world tour featuring the very best of The Cranberries. They are confident the new album will please their fans and win a legion of new ones.